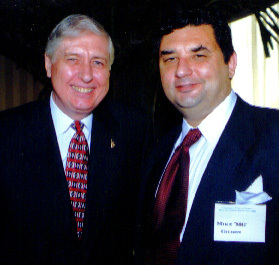 MARCH 22-24 1999 -- Harry Browne, the Libertarian Party's 1996 Presidential nominee, brought his as-yet-unofficial campaign for the year 2000 to Florida for a whirlwind three days of speeches and fund-raising. Visiting Tampa, West Palm Beach, and Orlando for a day each, Mr. Browne drew a total of about 175 Libertarian faithful and raised over $15,000. About a third of the people who attended had never been to a Libertarian Party event before. Mr. Browne said that his 1996 campaign spent $3 million, which was not enough to give it the visibility it needed to compete with the Democrats and Republicans. But current national membership in the party is three to four times as great as it was at this time four years ago. The party's growth in membership means a bigger base for fund-raising and would make at least a $10 million campaign possible. Such an increase would mean that the campaign could run national television commercials at the beginning rather than just at the end, attracting more attention from the public and the press and thus generating more excitement, more new members, and additional contributions. This could bring the Libertarian Party a whole new level of public awareness and acceptance and would improve our chances of having our candidate appear in the Presidential debates. Such increased visibility, Mr. Browne suggested, could possibly lead to a Libertarian being elected President in the year 2004. Mr. Browne argued persuasively against some of the "magic bullets" that have been suggested to put the LP on the map such as running a well-known celebrity or a billionaire for President. He said that the only thing that would induce such people to run on the LP ticket is for the LP to have a large enough organization to support their campaign. That's why party building and increased membership are so important for the party. Before he ran for President in 1996, Harry Browne was a highly respected investment advisor and best-selling author. He received nearly a half million votes, the second highest total ever for a Libertarian Party Presidential candidate.